After being trapped in the afterlife a father must return to save his family from a serial killing entity or be lost forever. Opening with an exposition flashback and picking up where part one left off director James Wan delivers another afterlife visual treat. 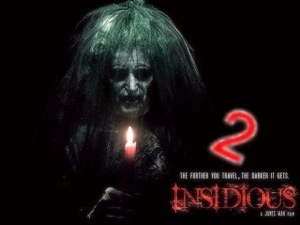 This sequel has its share of shrouded corpses, ghostly figures, an abandoned hospital and dilapidated houses to name a few. Thankfully this is not some cheap cash-in. What’s engaging is that the original cast return including the solid Patrick Wilson and Rose Byrne along with Elise Rainier and Barbara Hershey in their supporting roles. Worthy of note is The House of the Devil’s (2009) Jocelin Donahue as Hershey’s Lorraine younger self. To the casting directors credit the supporting actors who play the younger characters are successfully integrated. Of course for a bit of relief and grounding Tucker (Angus Sampson)and Leigh Whannell’s Specs also return. It’s stylised make-up of the ghostly faces and cross layering between and afterlife, flashbacks, spiritual time paradoxes are finely executed. While it has its fair share of creepy moments, notably a scene involving a tin can make shift telephone it’s debatably not as tension filled as the first instalment. That said, with a few twists and interesting exposition it keeps you on your toes from start to finish. What makes Chapter 2 shine is that writer Leigh Whannell expands the story building on his and Wan’s original concept without changing it too much, it really is a satisfying sequel and incorporates even some of the original’s scenes. Both cinematographer John R. Leonetti (Sleepy Hollow) and composer Joseph Bishara also return which again is in keeping with the first, retaining its atmosphere and look. Granted it’s packed with horror clichés but Wan’s execution and style give this an edge over many similar type of horrors. Overall, while not reinventing the wheel a satisfying follow-up. While robots keep the peace in other countries America has yet to convert. 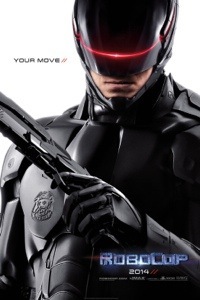 After an officer is left for dead, what is left of him is engineered into a robotic design and he goes about to arrest his killers but finds his investigation is putting himself in jeopardy. Forget Paul Verhoeven’s excellent 1987 original, many characters and story emphasis have been changed but for fans OCP is mentioned briefly and there’s some dialogue nods to the original to name a few. Director Jose Padilha’s incarnation is pleasantly different enough to avoid comparison and he certainly puts his own stamp on the subject material although there are unavoidably elements reminiscent of The Vindicator (1986) and The Wraith (1986). The action is frantic, and gritty with plenty of graphic scenes and violence, for example Robocop’s innards out on display, lungs, brain and oesophagus also there’s an intense shoot out even though on occasion Padilha’s uses thermal imagery to possibly avoid censorship. But a film shouldn’t be about a rating, Padilha’s offering is about heart with it ending on a high and a hark back to the original Robocop design. All in all the special effects are impressive, the shooting style is what you’d expect from a modern action. This version is more a cop story than robotics. What’s on display delves into corporate corruption (less ‘Wall Street’ than the 1987 version) and (saldy) skims the street crime underbelly. Samuel L. Jackson is Pat Novak, his segments (a show with theme tune of the original film’s theme music) replaces and updates the commercial satire adverts and news reels, he’s more of a political presenter /analyst, needless to say Jackson is on his usual top form. Both Gary Oldman as Doctor Norton with a heart and Michael Keaton as OmniCorp’s head Sellars are outstanding and are what you’d expect for their caliber. Joel Kinnaman is a fitting Robocop/Alex Murphy and carries the emotion, as here it’s about his relationship with his wife (Abbie Cornish) making it more focal, which was only touched on in Robocop and part 2. The supporting cast are all high calibre including the likes of Jackie Earle, Aimee Garcia, Jay Baruchel and Jennifer Ehle. Like its predecessor’s social commentary another appreciation for the 2014 version, which may be overlooked, is its own subtle societal commentary, including but not limited to- overseas, non-domestic manufacturing, i.e. Robocop is made in the east, countries marketing and distributing its products/ideals/morals without adopting them themselves and so on. It will be interesting to see where a sequel will take Alex Murphy – part remake, part cop story, all new Robocop, surprisingly recommend. A washed up alcoholic is kidnapped and imprisoned in a single room by his unseen captors for 20 years. After finding that he has been framed for murder he sets out for revenge and vindication. And while bettering himself in the process he aims to find out why he endured his confinement. 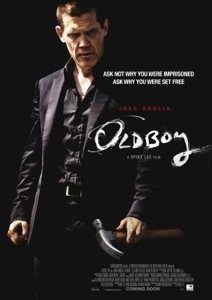 A solid remake of the great South Korean film based on the Japanese Manga ‘Oldboy’ by Nobuaki Minegishi and Garon Tsuchiya. With plenty of homage’s to Chan-wook Park’s 2003 original Spike Lee adaptation makes some minor changes to the story some are for the better including a more fitting closing. Pacing however does feel choppy/rushed in places possibly due to studios heavy editing intervention. Lee’s offering is wonderfully filmed and acted, Samuel L. Jackson leaves an impression but Josh Brolin excels and clearly was 100 percent dedicated to the role, surprisingly executing the action scenes with surreptitiousness. The casual viewer may not find the dark humour, peculiar characters or reveal palatable. Nevertheless it equals or debatably surpasses the likes of Sixth Sense, Angel Heart, The Usual Suspects to name a few with its surprise ending. Ultimately, those who want a gritty psychological thriller with a spot of action and a fantastic twist look no further. Possibly curious viewing for fans of Park’s original but a compelling must see for viewers not familiar with the story.